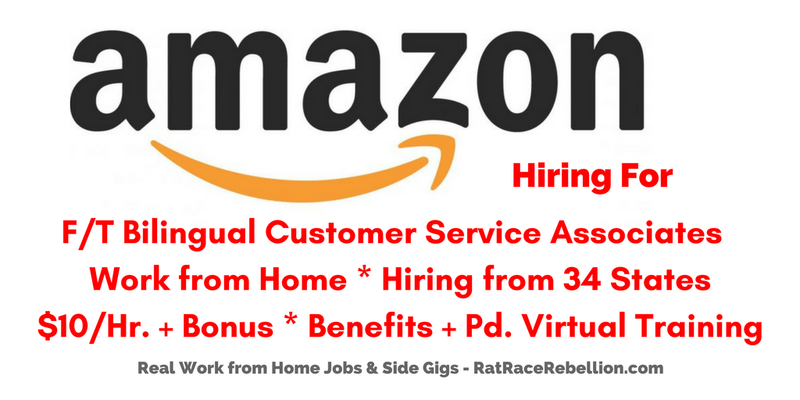 Amazon is hiring full-time bilingual Customer Service Associates. You’ll be helping customers primarily by phone and chat. For health care we offer a choice of four medical plans as well as prescription drug benefits. Additionally, employees can make demands on additional dental or vision plan. For occupational retirement provision there is the possibility of a 401(k) savings plan with a company match. Additionally, we offer a company-paid life and accident coverage as well as some optional additional dependent coverage. Amazon employees receive a company-paid short- and long-term disability plan. There is also a health-care and dependent-care flexible spending account. All Amazon employees and their eligible family members can take advantage of a free and anonymous Employee Assistance Program (EAP) for work-related or private issues (e.g. legal or financial questions, family issues or other work-life topics). Additionally, we offer a child and elder support as well as pet assistance. Eligible U.S. employees can be reimbursed for qualified adoption expenses, such as adoption fees, attorney fees, court costs, and travel costs, up to $5,000 for a single-child adoption or up to $10,000 combined maximum for a sibling-group adoption. Our employees can flexibly shape their individual working hours in the framework of trust. Employees get vacation time and up to six paid personal days per year. Additionally, there are six annual holidays per year. Up to 4 weeks of paid pre-partum medical leave, followed by 10 weeks of paid maternity leave. Additionally, all new parents who have been at Amazon for a year or more can take a 6-week paid parental leave. Leave Share program gives parents the flexibility to share all or part of this paid parental leave with a working spouse or partner whose employer does not provide paid parental leave. Ramp Back Program allows new birth mothers or primary care givers to ease back to work with up to 8 weeks of flexible time and a choice of part-time options. Eligible employees receive Restricted Stock Units (RSUs) from Amazon.com Inc. as part of our global compensation model. All Amazon employees participate directly in the success of the entire company. Employee reviews on Glassdoor give Amazon 3.6 stars out of 5. For details on the job and to apply, click here. For more jobs like these, be sure to check our Newest Jobs & Gigs page. To get our job postings ASAP, like our Facebook page and check your feed for our posts. May you be rocking your Rebellion soon! This entry was posted in Bilingual jobs, Customer Service Jobs, Jobs That Don't Require a College Degree, Jobs with Benefits, Work at Home Jobs and tagged Amazon. Bookmark the permalink.